Servicio de Administración Tributaria agent Luis Alberto De Alba Mota walks past a northbound truck Monday. October 30, 2017, at the Starr Camargo International Bridge in Rio Grande City. A partner ship with U.S. Customs and the Servicio de Administración Tributaria in Mexico would consolidate inspectors for both countries to one side of the border. 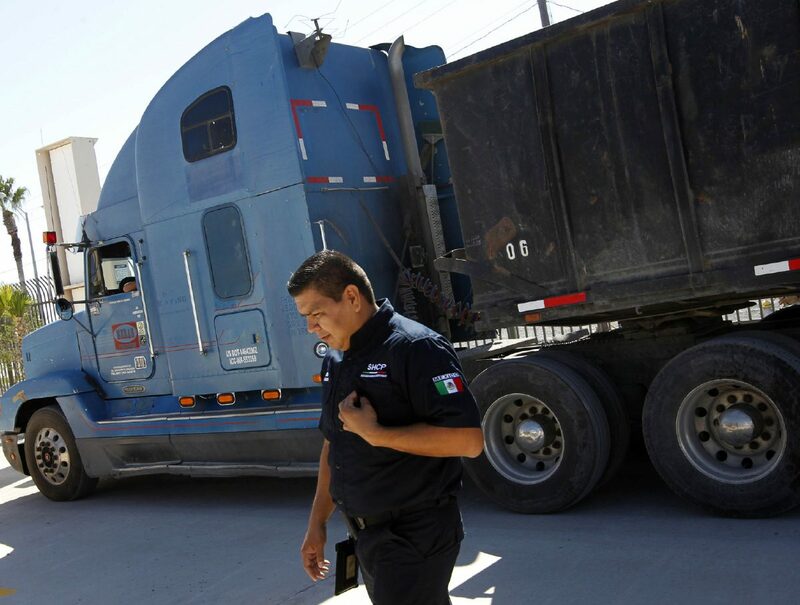 RIO GRANDE CITY — Crossings for cargo trucks could become more efficient at the port of entry here with the implementation of a new program allowing officials from the United States and Mexico to inspect trucks at the same time. The Rio Grande City-Camargo International Bridge began implementing Unified Cargo Processing on Monday for the simultaneous inspection of cargo trucks by agents of both countries, eliminating the need to be inspected again after they cross the bridge. The process is a collaboration between U.S. Customs and Border Protection and Mexico’s Tax Administration Service (SAT). The RGC port sees about 300 trucks pass on a busy day, according to Sam Vale, president of the Starr-Camargo Bridge Company, who added he expects about 70 percent of their customers to participate in the joint inspections. The RGC port is the first in the Rio Grande Valley to implement unified processing and is only the second in Texas behind the port in Laredo. CBP envisions the program will have numerous benefits, said Brad Skinner, assistant director of field operations at the CBP Laredo office. The concept of joint inspections started off slow, said U.S. Rep. Henry Cuellar, D-Laredo, and required changes to Mexican law. In 2015, Mexico’s Chamber of Deputies approved changes to the country’s firearms law, thus enabling foreign immigration and customs authorities to carry weapons when working in Mexico.